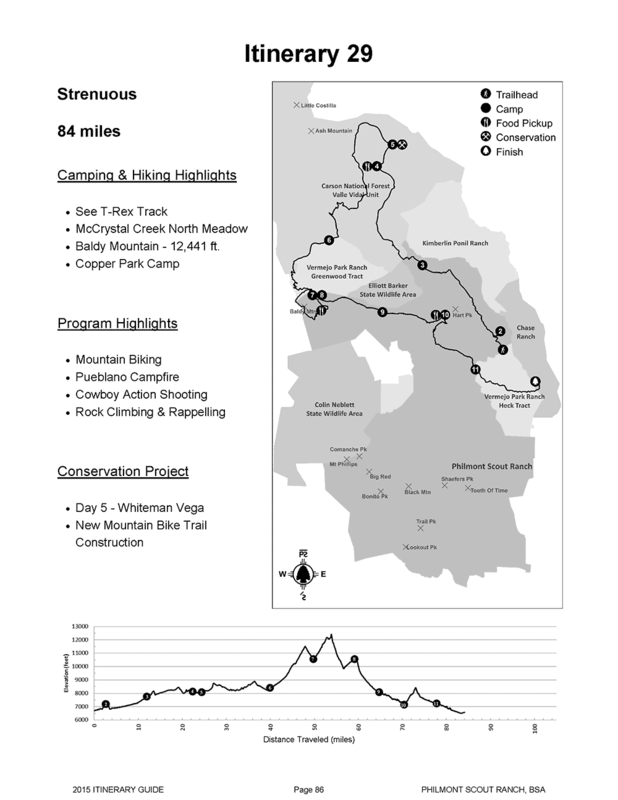 My son’s Boy Scout troop planned a trip to the Philmont Scout Ranch in Cimarron, NM. For those of you, like I, that were not in Boy Scouts when younger, there are four official “high adventure” bases in Boy Scouts: Philmont in NM (land activities), Sea Base in FL (sailing/boating/water sports), Northern Tier in MI (canoeing in the boundary waters between US and Canada) and Summit in WV (land activities). 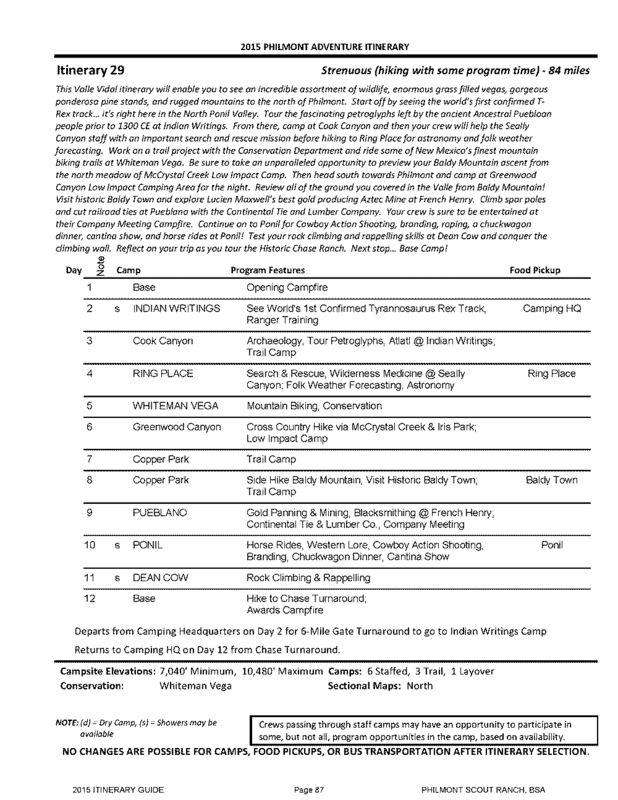 The idea is that your crew (a small group of between 7 and 15ish) of scouts, venturers (males and females from 14 to 21) and some adults picks an itinerary and submits it to Philmont. They will tell you if you are allowed to go on that trek. Treks vary in days out, mileage and difficulty. We took a 12 day trek (itineraries are here) but there are 7 day treks and many other configurations. Think of a trek as playing a huge game of connect-the-dots with yourselves backpacking the distances between the dots. Each “dot” is a camp site that is either a trail-side camp or a staffed camp. Staffed camps have “programs” at them. These vary from camp to camp but can be everything from rock climbing to gun shooting to mountain biking to spar-pole climbing to conservation activities and more! Staffed camps also have “interpreters” that portray characters from times long ago (usually around the 1900-1930s). These interpreters are in period dress and do a terrific job of making weary backpackers feel right at home. Let’s get this out of the way in the beginning. These treks are out in the back-country (that means the wild!) where there usually is no plumbing. Let me tell you how we got food, water and what we did with the waste. Philmont provides breakfast, lunch and dinner for you for your entire stay. When you are in base camp (see below), you eat in a cafeteria. Once on the trail, you get a bag that you share with another person on the trek. In the bags are a variety of foods. Check out the breakfast, lunch and dinner links if you’d like. These foods were things like energy bars, Gatorade drink mixes, jerky, crackers and such. The PDFs show them much better. You pick up these food bags from a commissary at various points in the trek so each day you may be carrying from 1-4 (or more) days worth of food with you. We had a number of options for water. First, some staffed camps had potable (good to drink) water. That was always nice because it was easy. Our next option was to use our gravity water filters that some of the adults brought to filter the water and make it safe to drink. If we couldn’t/didn’t want to do that, we could use the Katadyn Micropur tablets that the Philmont staff amply provided to us. These were the lowest on our desirability level since we had to wait 30 minutes for the water to be safe to drink. But, the chemicals were very good and didn’t taint the water with bad smells or taste. So, when food goes in, stuff comes out. At Base Camp, there is plumbing and such to use just like at home. But in the back-country, these accommodations are not available. For peeing, you go somewhere semi-private away from trail, water and camp sites and find a rock to pee on. So instead of saying “I need to go to the bathroom”, for a #1 you say “I need to go find a rock”. OK. #2s are done in either a “Red Roof” (outdoor privvy/outhouse usually at staffed camps) or you dig a hole in the ground 6-9″ deep and go in that. You bring your own TP with ya and Philmont supplies the hand sanitizer. I recently got my Technician’s class amateur radio license with the help from the wonderful people at NoVA Hackers. I did this so that if we were in the back-country, miles away from anything and certainly outside of the range of cell phone towers, I could use a handy talkie (portable radio) to call for help. While I didn’t need to call for help on this trip, bringing along the radio was fun. I did a little research before going out to Philmont and found that they had registered several frequencies with the FCC. I took these and programmed them into my Baofeng BF-F8HP handy talkie before I left. I also added other frequencies (like the NOAA weather stations). I found that Philmont (this year) used the 463.525MHz frequency on their main repeater for most everything from infirmary consultations to where their drivers were to nightly updates of weather. Most of the staffed camps had radio base stations that they used to communicate to base camp. Some of the other camps used other frequencies for more local communication. For instance, the staff at Whiteman Vega were using 467.850MHz to communicate between the people at the Whiteman Vega base yurt and the staff that took people out on the mountain bike rides. Easier to radio in “Hey I have a person with a flat tire. Can you bring a spare out here?” than to walk your bike back. As these radio broadcasts were our only connection to the outside world for 12 days, they boosted our moods on long days and we enjoyed listening to them. Our scouts decided that they wanted to do a strenuous trek of 86 miles. Now, let me preface this with 86 miles is the MINIMUM number of miles that you may log on the trek. My wrist step counter clocked me doing over 130 miles during this trip. We chose trek number 29. It is below in itinerary and description. This trek was less about doing “programs” at staffed camps and more about seeing some amazingly beautiful country in the Valle Vidal region north of base camp. You may also notice that we were at least 8 days without showers (the little “s” in the second column in the above pic). This wasn’t as bad as it sounds. Yeah, we smelled. Yes the scouts smelled worse. But it wasn’t terrible. In the next blog post I’ll go into detail about our trip and post some pics. Thanks for the article -how did the battery work out on you walkie talkie? Worked out really well. Without transmitting and with only using it occasionally didn’t have to recharge it once.